Synagogue mural by Samuel Gruber, ca. 1910. 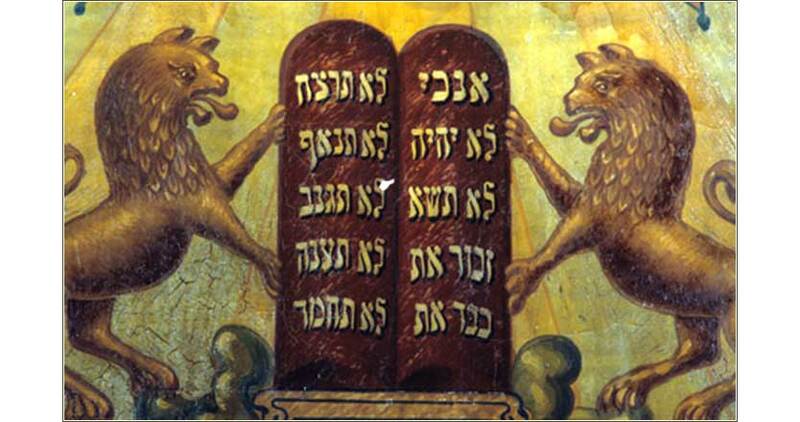 The “Lion of Judah” (David) upholding the Ten Commandments. John Hurt was the definition of “untutored genius”. A dirt-poor black sharecropper in the Great Depression, he developed his distinctive soothing sound because he couldn't afford real guitar strings. 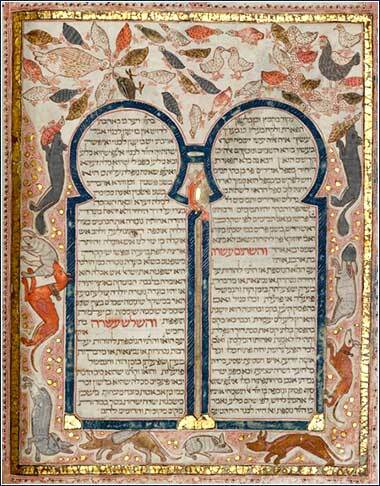 Tanakh (Jewish Bible), North Africa, possibly ca. 1200. Now the rest of the acts of Solomon and whatever he did, and his wisdom, are they not written in the book of the acts of Solomon? Thus the time that Solomon reigned in Jerusalem over all Israel was forty years. And Solomon slept with his fathers and was buried in the city of his father David, and his son Rehoboam reigned in his place. God, when He was creating the first covenant with the Hebrews, had a mind-boggling array of laws concerning their duties as a nation, personal conduct, and worship, down to a number of tiny specific details. As important as all the commandments and laws may have been, there seem to have been two things that He valued as primary; or perhaps these are simply where the Hebrews failed most badly. First, to live in total faith and fear of Him, and no other god(s). Secondly, to conquer and rule Canaan at His direction, and thus fulfill His great promise to Abraham. The importance of the second rule is hard for most people to grasp. We were raised on a Christian morality and internalize it as eternal truth. But it is not timeless; Christianity began with Jesus. God commanded the Hebrews to conquer Canaan by the sword; it was their duty to God to accomplish His will. A Jew living in Israel in 40 B.C. lived under a different covenant — a different set of commandments from God — than the same person in 40 A.D. Christ fulfilled the old covenant and brought the new. But we cannot go back and criticize, or even comprehend, the Old Testament by imposing upon it values that originated with Christ. The central importance of conquering Canaan colors the end of Solomon's reign. Solomon, although he had built the great Temple and loved the Lord (especially early on), gave in to the worship of idols, because of his foreign wives; yet, God did not take away Solomon's kingship of all Israel because of His love for David! Why did God love David so much? He was a murderer and adulterer, offences that we today find terribly serious. But David did two things right: He worshipped God and placed his faith in Him, and he conquered — as the Hebrews had failed to do for 400 years before him — the entirety of Canaan. So Solomon was the pinnacle king in the history of Israel in many ways, especially his inordinate wisdom and his fabulous wealth and power; but it was David to whom Jesus would trace his ancestry, not Solomon; and David whom God loved. Nobody before David, and nobody after, did what God had commanded: put all of Canaan under Hebrew rule. The strength of God's love for David proves, by implication, the importance of His commandment that the Jews subjugate and inhabit Palestine. The Lord has expressed his wrath; Israel will be taken from Solomon's heir. The history of the two kingdoms is extremely long and complex — there were 20 kings of Judah and 19 of Israel after Solomon, not to mention 5 major and 12 minors prophets with separate books — so we will follow a much-abbreviated version.